Today Breitbart posted an article about Georgia gubernatorial candidate Stacey Abrams (D). In an interview, Ms. Abrams admitted that a possible outcome of her gun control plans could be that “people would turn their guns in.” That is her opinion. It contradicts the Second Amendment, but that is her opinion. Abrams began by telling host Jake Tapper that “AR-15s are not necessary on our streets.” She then called for more gun control “semiautomatic weapons” in general. She did not mention that semiautomatic handguns like Glock, Kimber, Ruger, Walther, Sig Sauer, Smith & Wesson, Springfield Armory, etc., are the go-to choice for concealed carry and self-defense. Rather, she simply called for new controls for firearms with semiautomatic actions. Meanwhile, another Breitbart article shows members of the New Black Panther Party wielding weapons and holding signs supporting Democrat gubernatorial candidate Stacey Abrams. I sense a contradiction here. 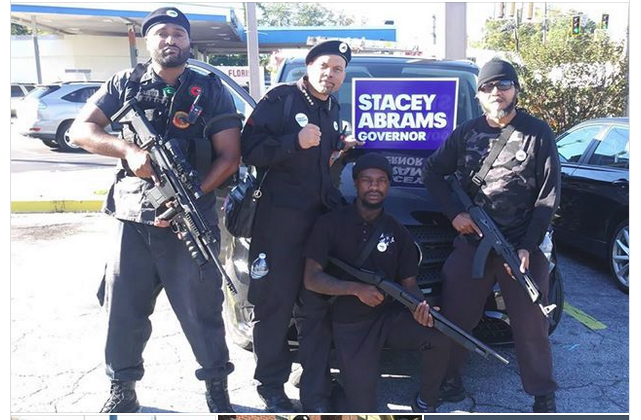 In Ms. Abrams’ opinion, is it okay for them to have the guns they are holding? As governor, would she take their guns away? Good luck. For whatever reason, we seem to have returned to the racial tensions of the late 1960’s. I don’t quite understand how, when we have positive models of success in the black community, race relations have deteriorated, rather than improved. I suspect the following interview, posted at Breitbart.com might give us a clue. …Omowale used the interview (“Aaron Klein Investigative Radio,” broadcast on New York’s AM 970 The Answer and News Talk 990 AM in Philadelphia) to claim five states as belonging to the “Black Nation”: Louisiana, Mississippi, South Carolina, Alabama, and Georgia. Omowale is also co-founder of the Huey P. Newton Gun Club, a black militant gun group named after Black Panther Party founder Huey P. Newton. According to reports, Dallas shooter Micah X. Johnson “liked” the Huey P. Newton Gun Club and Omawale has said that he recognized Johnson from black community events in Dallas. …There is no way that we can totally separate ourselves in the United States of America and we are aware of that. We know that we are owed land, we are owed monies, we are owed restitutions and we are owed reparations. That’s going to be a continuing process. What we are saying right now is we want to control the economics in our community. We want to control the black dollars. The money that goes in, the money that goes out. We want to control the politics in our community. If a politician is not bringing anything to the table for the betterment of that community, we are not going to vote for these particular people. And we most definitely want to control the education. What our people are learning in what we call the public fool system, not school system, where they are teaching and misrepresenting the true history of the black man here in the United States. That does not sound like a leader who is interested in peaceful coexistence–that sounds like someone who feels entitled to what other people have earned. I have no problem with building the black economic community by helping black people start and run businesses within their communities. Recently I heard a black businessman state that in many cases, people in the black community do not frequent businesses run by black businessmen in their communities because somehow they have gotten the idea that the products or services offered by those business are somehow inferior (although generally they are not). Frankly, there is a local black businessman who runs some of the best car washes in our city. There are a few things that need to be constantly restated. There is no American alive today that owned slaves. Many of the Americans in the country today are descendants of people who arrived after the Civil War. No one is entitled to anything another person has worked for unless personal responsibility for some harmful act has been legally established. Part of our current race problem was predicted by Senator Daniel Patrick Moynihan (my favorite Democrat ever). Senator Moynihan felt that the Aid to Families with Dependent Children (AFDC) Program passed by Congress encouraged women to kick their husbands out of the house. He predicted that this would destroy the black family. It did. It is time for everyone to get out of the boat and start rowing in the same direction. There will always be inequality of outcome, but we need to do all we can to create equality of opportunity. Yesterday Big Government posted an article about a new court ruling in the Black Panthers voter intimidation case. The Department of Justice has claimed that since the case was dismissed on May 15, 2009, all documents relating to the case, even those produced after that date were subject to the “attorney work-product privilege.” The court ruled that documents produced after May 15, 2009, were not subject to “attorney work-product privilege” and should not be withheld. We already know the Obama administration’s claim that political appointees were not involved in this decision is patently false. And now DOJ officials continue to fight tooth-and-nail to stonewall the release of additional information. What else do they have to hide? This new court ruling means that we may pry loose some additional information on this voter intimidation scandal and perhaps get to the truth in the matter. Judicial Watch has led the fight to have the documents relating to the New Black Panthers voter intimidation incident made public. The YouTube video makes it clear that the New Black Panthers were not your ordinary poll watchers. It has been a long battle, but hopefully, if anyone obstructed justice in this matter, he will be fired.